The Average Gamer is a motley band of independent gamers who love writing about games. If you like what we do and want to help us do it better, there are a few ways to support the team. 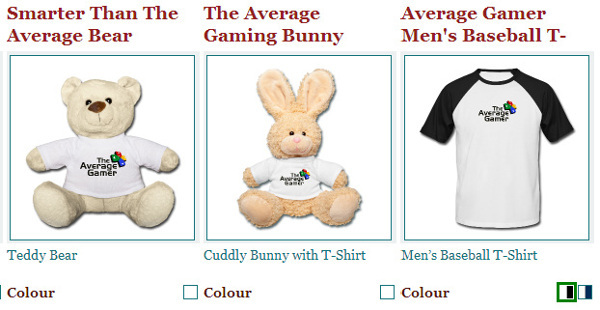 We can take monthly pledges, one-off donations or if you’d rather get something tangible for your money, there’s now a range of T-shirts and other Average Gamer branded merch. We do prefer monthly pledges because they can help with longer-term planning but we’re grateful for any support, of course. If one-off donations work better for you, there’s a button at the bottom of this page. Thanks very much. Over on Patreon you can pledge from just $2 per month. In the milestones section, you’ll see a breakdown of what it actually costs to bootstrap a site of this size, albeit in US dollars. Think of it tossing a bit of money in the tip jar each month for a site you enjoy reading. Pledge over $15 each month (about £9) and you’ll get your name on our VIP backers page which I will definitely make and link here when someone pledges. Our fetching logo allows you to proudly proclaim your status as a typical gamer. We’ve slapped it on all manner of objects, from badges to bears to bibs to b-shirts. I mean T-shirts. Each item is printed on-demand by Spreadshirt and posted directly to you. I can vouch for the quality of T-shirts myself – I have two at home. If you’d rather skip Patreon or do a one-off donation then you can donate directly to our PayPal account. PayPal seems to eat about 8% in currency exchange fees if you’re not in the UK, just so you know. Use this button to make a monthly donation through PayPal. However much you like, it’s all appreciated. I know it says “Subscribe” but this doesn’t sign you up to a mailing list or anything like that. Also, I apologise for the awful alignment of these buttons. THANKS PAYPAL. I’m working on it. And here is the button in case you change your mind. Sorry to see you go! Thanks for taking a look at this page. Happy gaming!